Acute porphyria attacks are 4-5x more common in women than in men and most often present in the third decade of life. Only 10-15% of patients who carry the genetic mutation causing the porphyria will ever develop an acute porphyric attack and many (approx. 1/3) patients will not have a known family history of porphyrias. It remains poorly understood what exactly causes patients to suffer an attack, however, some postulate that damage from free radicals, heme deficiency within the nervous system, and/or toxicity from aminolevulinic acid ALA may lead to an attack. The bottleneck that is caused by an enzymatic deficiency of any of the inherited acute porphyrias will cause a buildup of ALA, which has been shown to be neurotoxic centrally as well as peripherally, and may cause the autonomic and peripheral neuropathy associated with acute porphyria attacks. The presentation of an acute porphyria attack can be quite variable, but the most common symptom is excruciating abdominal pain. Typically pain is so severe that it may mimic an acute abdomen that necessitates narcotic pain relief. Preceding these attacks, patients may have some behavioral changes, such as insomnia and anxiety, that can progress onto peripheral neuropathies, autonomic instability, and even generalized paralysis. One diagnostic clue that occurs 70-75% of the time is the presence of dark urine, similar to a glass of red wine, which should further raise suspicion of an acute attack. Blood work will likely be low yield; patients may have a mild hyponatremia, hypomagnesemia, renal impairment, and/or rhabdomyolysis. 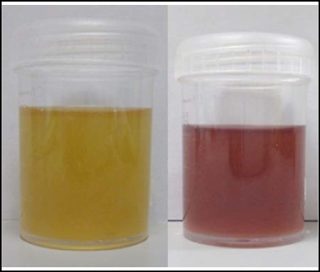 To confirm the diagnosis of an acute porphyria attack, a light-protected urine sample should be obtained from the patient. Most hospitals should have access to at least a semi-quantitative assay to screen for the presence of porphobilinogen (PBG) in the urine, which will typically show PBG levels elevated 5-10x normal. Of note, the excessively rare ALA-D porphyria will not produce PBG and therefore, cannot be screened out using the PBG assays. If a high suspicion for a porphyria remains following a negative assay, it may be warranted to discuss with a specialist for further testing. While none of these signs or symptoms can confirm the diagnosis, they should raise the provider’s suspicion for an acute porphyria attack. There are multiple endogenous and exogenous factors that can induce heme synthesis and stress the hindered biosynthetic pathway of patients with acute porphyrias. Most notably are commonly used medications such as oral contraceptive pills (OCPs), hydralazine, simvastatin, erythromycin, and anti-epileptic medications that can throw patients into an acute attack. Additionally, low caloric intake, alcohol use, hormonal changes, and concomitant infections can also induce an attack, while hyperglycemia may also lower the threshold for an attack. Despite the etiology of the attack, the same treatments hold true for the inherited acute porphyrias. The mainstay of treatment is to decrease the production of the toxic ALA with heme and glucose administration. In an effort to avoid a catabolic state, patients should receive 10% dextrose in normal saline (NS/D10) at 100ml/hr to receive approximately 200 grams of dextrose a day. If the patient is tolerating oral intake, they can also carbohydrate load orally which will help to decrease the production of ALA. In the United States, there is lyophilized hematin, however, most other areas of the world have heme arginate. Intravenous heme, indicated in patients presenting with motor neuropathy, at a dose of 3mg/kg/day has been shown to decrease the duration of symptoms when compared to only glucose administration, as well as decrease the length of inpatient stay, amount of analgesia required, and pain control needed. Thrombophlebitis can occur with IV heme infusion and is it recommended to be given by a central line. Otherwise, symptomatic care should be provided with special attention paid towards avoiding the porphyrogenic medications. In 1996 the mortality rate of acute porphyria attacks was 14%, but more recent studies now estimate it to be between 1-2%. Mortality typically arises secondary to respiratory failure due to acute neuromuscular involvement; delay of diagnosis and treatment can lead to worse outcomes. While the acute porphyrias are rare entities that many emergency physicians will not encounter, they offer another possible diagnosis to a seemingly scary situation of an acute abdomen with a normal work up. So when the next patient arrives with excruciating abdominal pain, some neuropathy, and perhaps dark urine as well, be sure to think about an acute porphyria and not just another case of hypodilaudidemia. 1. Cuoghi C, Marcacci M, Ventura P. The Acute Porphyric Attack: A Difficult Diagnosis for a Potential Lethal Event in Emergency Medicine. J Emerg Med Trauma Surg Care. 2015;2:005. 2. Ventura P, Cappellini M, Rocchi E. The acute porphyrias: a diagnostic and therapeutic challenge in internal and emergency medicine. Intern Emerg Med. 2009;4:297-308. 3. Pischik E, Kauppinen R. An update of clinical management of acute intermittent porphyria. The Application of clinical Genetics. 2015;8:201-214. 4. Findley H, Philips A, Cole D, et al. Porphyrias: implications for anaesthesia, critical care, and pain medicine. Continuing Education in Anaesthesia, Critical Care & Pain. 2012;1:1-6.